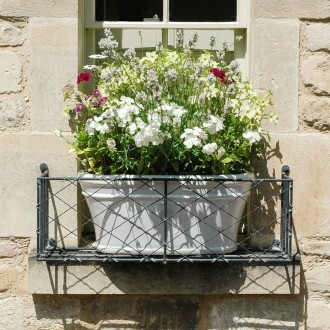 Cut a dash on your patch with colourful (or even minimally monochrome) planting in stylish, sturdy window boxes. Not only for spring and summer, refreshing seasonal displays in multiple miniature gardens will keep you or a garden design client not just up with the Joneses but streets ahead. Grow kitchen herbs within reach of the chopping board, play with colour combinations and textures, enjoy the glorious scents of fresh flowers and foliage, encourage wildlife into tight urban spaces and don’t forget that in school holidays activity-hungry children can be happily engaged with choosing plants, planting and watering. There are so many benefits to installing well-made long-lasting window boxes, depending on your planting choice. Bring the outside in and imagine plants at every glance, seen from inside the home or office. We’ve plucked just a handful of hard working candidates for seasonal window boxes in the UK. Explore the looks on our metal window boxes pinterest board. Spring colour: tulips, daffodils, grape hyacinths and the larger variety of hyacinth, crocus, iris reticulata. Summer flowers & foliage: lavender, geraniums, nicotiana, antirrhinum, small poppies, dwarf ferns, trailing lobelia, begonias, busy lizzies, succulents (including trailing). Summer herbs & edible: rosemary, parsley, chives, basil, oregano, sage, mint, trailing strawberries, nasturtium, myrtle. Winter and evergreen: box, heathers, trailing ivy, dwarf hebes, winter savoury. Garden Requisites window boxes suit any style of property – country house or cottage, town house or flat, traditional or modern. Handmade, corrosion resistant, zinc-galvanised window box frames will be long-lasting homes for vintage or contemporary pots and planters that reflect the character of your place. Something as simple as our rectangular or circular lead-look metal planters filled with lavender, clipped box or other single-plant displays, can be really striking – sleek and stylish. The joy of pots and planters is also that, to maintain seasonal impact, they can be prepped and easily swapped in and out of a main garden or holding area. Where will your window boxes be and how will you fix them? Windows don’t have a monopoly on window boxes – they can also be fixed to wonderless walls, adding pizazz to bare courtyards. You may have your eye on a row of ground floor windows, just the kitchen or a full house façade, either way, no specialist knowledge (beyond regular DIY skills) is needed to fix up Garden Requisites boxes and pop planters in. High-quality fixings are delivered with all our off-the-shelf or made-to-measure window boxes. Integrally welded eyelets enable the installer to line the box up with hexagonal head coach screws that have been screwed into pre-drilled holes filled with rawlplugs. For higher windows, we can make window boxes that can be fixed within the sides of the walls i.e. from inside the property. There’s not a lot more to know but we’ve had many years of experience of customers fixing our structures to all sorts of materials. Give us a call if you’re not sure, or if you are sure for that matter!